Like I said in Graceful Charity’s review, this is the other card (2 out of 3) that can directly contend with Pot of Greed as providing more advantage. The last one is Chaos Emperor Dragon, which is banned. The reason for this one is purely mathematical; this card, too, provides a 2 for 1 advantage. One from your hand and 1000 life points and you’ll take out 2 cards from their hand. The 1000 life points is basically trivial, and if they don’t have Sinister Serpent, you’ll undoubtedly take down two very useful cards to them. You have less than 2 cards in your hand, they have less than 3 cards in their hand or Sinister Serpent, or you have no field control (or less than 1000 life points). Obviously, a card that can contend with Pot of Greed (and is even better than it in the first three turns), is a card that gets a near perfect score. Advantage F/H: Two cards for one is good because, in this environment, one thousand life points is almost ALWAYS worth a card. Deleting your opponent’s options is always a good move. Best Draw for the Situation: Always a good choice in the opening hand, the fact you can use it in the beginning and midgame almost single-handedly gives this card a perfect score. Dependability: What this card requires, almost, is your opponent to have no Sinister Serpent (almost impossible to tell), or (more importantly) two cards in hand. They’ll almost always have two cards in hand. ++ The heaviest contributor, by far, to Enemy Disruption. As I eluded to in yesterday's CotD, the new God hand will be Pot/Graceful/Delinquent. Delinquent came back in exchange for Forceful and Confiscation being gone. 1-for-1 trade...not many run Despair from the Dark, and even the Zombie decks don't main a lot of those, siding them if anything. I think this card is right in coming back, as it becomes far less useful as the game goes on, and the only time it's truly broken is in the opening hand, or when your opponent has exactly 2 cards left in their hand which aren't Serpent or an effect that activates from being discarded. It's still 5/5 all formats. Coin Flip Delinquent Duo is also a staple. Run it or be at a severe disadvantage. Your choice. New Advanced? Play it. But watch out for Despair from the Dark since Zombies are better. Today’s card is probably the worst (and by worst I mean most useful) of the newly un-banned cards, Delinquent Duo. At the small price of 1000 Life Points, Delinquent Duo forces your opponent to discard one random card and one chosen card from their hand. Now what could possibly be so great about this effect? Well think of it this way; if you go first and you manage to have Delinquent Duo as one of your first 6 cards, you can get rid of two possible threats before your opponent has a chance to use them or to counterattack. Even though this would be the best time to use Delinquent Duo, it is by no means the only time. Whenever your opponent has 2 or more cards in their hand it is an excellent time to activate it. Even if the 1000 Life Points seem a little steep, you’ll be glad you paid it. This effect has caused the most of the distaste this ban list has dished out, simply because cards with effects such as Delinquent Duo’s should never be allowed to be used. While you may greatly enjoy using Delinquent Duo, you will greatly dislike having Delinquent Duo used on you. Because of this, Sinister Serpent should pop up in every Deck, assuming it was not already residing there. While the reason to use it may be a bad one, having the chance to cut Delinquent Duo’s effect seemingly in two will a welcomed gift to most. So expect Sinister Serpent and Delinquent Duo to work their ways into all competitive Decks. Advanced Format: 4.5/5. Everyone will use it; no one will enjoy it. Traditional Format: 5/5. One word: Yata. Art: 3/5. The bows on their tails take away from the evilness of the pair. dawnyoshi Our latest forbidden list update saw the banning of two commonly played destruction cards: The completely dominating Forceful Sentry, and the less dominating but powerful Confiscation. Both cards saw constant play, which justified their ban. In its place, the mischievious demons from a year ago have been released to cause havoc once again...was it a smart move? We'll see in a few weeks. Delinquent Duo was once again released on this environment. Delinquent Duo combines better aspects over the two newly banned cards, but also lacks some of their power. For 1000 life points, you're able to thin your opponent's hand of two cards. This is a wonderful 1 for 2 deal, and is bound to give you card advantage over your opponent...most of the time. One of its lacking aspects is that you cannot see your opponent's hand. You won't be able to plan and counter any strategies they may have ready. The first discard is also random, which is a danger to the opponent, or you if they're running cards like Despair from the Darkness. The 2nd discard is a choice of the opponents, which in the early game, may benefit them. This card is usually a terrible play against zombies, which have many counters to hand destruction, and fiends, which abuse Night Assailant and the fiends in their graveyard. Lockdown decks also hold an advantage against this card, as they usually utilize both Night Assailant and Sinister Serpent. However, Duo, unlike the other two, can be a useful game winning card in the mid or late game. This gives it both an edge over the other two, and a disadvantage. We'll have to wait and see how players use this card, or what decks will be dominant. In limited, it's a 1 for 2 deal. This is good, and unless there's a really good card draw effect or monster in your draft pack as well, you will notg be passing this up. It's always a must play. Let me say, ever since I joined this game (with a background of running disruption decks in Pokemon (lol that game was the sh!t) and Magic), right before the release of LoD…this was a card I ran and almost no one else did. 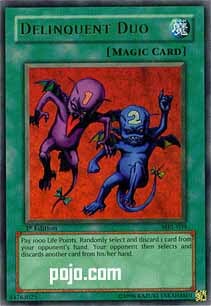 On that segue, Delinquent Duo is and probably always will be [b]THE best spell card IN THE GAME[/b]. Period. The fact that the most superlative spell card in Duel Monsters is now being cycled back into tournament play is just tomfoolery. It’s obviously waiting to be abused, need I explain why? A first turn Delinquent Duo IS unfair. It’s not like Pot of Greed opening the game, because if your opponent opens with a Pot, you can be sure that “yours is still in the deck” so you’ll eventually match them (or at least, there’s a high probability you eventually will get it). But with Delinquent Duo, the other straight up 2-for-1 spell card, you can’t be sure of anything. Your opponent is limiting your hand to 4 cards (after draw) to their 5, AND they might have discarded your Pot, Graceful, Delinquent, or any other 2-for-1 card that you may have needed to come back with later on. It’s basically cheating. Except legal. Paying 1000 LP for a godly effect is NOTHING, as has been proven (and preached by myself) through the extensive use of Magical Scientist, Confiscation, and the LoD Fusion monsters who negate effects aka Balter and Senshi. So, it’s not really a downside to the cost of Delinquent Duo to start the game at 7000. Sure, later in the game, it might turn into a Confiscation or could start hitting in-hand tributes, but come on, what more do you WANT from a card? And wouldn’t you rather be sure that your opponent has no hand than be “guessing” if it’s a tribute or not? And don’t get me started on getting DD back with spell recursion. In fact, I won’t even say anything – if you’re recurring a spell these days, it better be Pot, Graceful, or DD unless whatever else you’re getting back will win the game immediately. Or else you’re on drugs. Period. With that, I rate Delinquent Duo a [b]5/5[/b] because, even if you’re running like…Exodia, stripping your opponent of two cards at any time is godly. If you don’t agree this card is perfect, you’re just wrong. Peace ^_^.